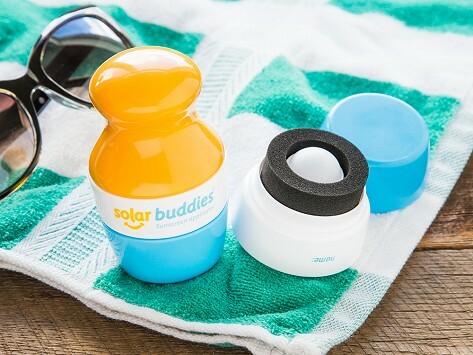 This refillable and reusable roll-on sunscreen applicator puts kids in charge of the task (with a little adult supervision). The ergonomic grip is easy for little ones—or anyone, really—to handle. The sponge and rollerball application combo provides even coverage. Dimensions: 2.4" x 2.4" x 6.3"
This applicator is so easy to use my 3 year old granddaughter could apply sunscreen to herself. Great product! We and kids love it. We have a red-headed, blue-eyed grandson who loves baseball and the pool. He won’t go out now without his Solar Buddy. Great product. The kids can put on their own sunscreen.